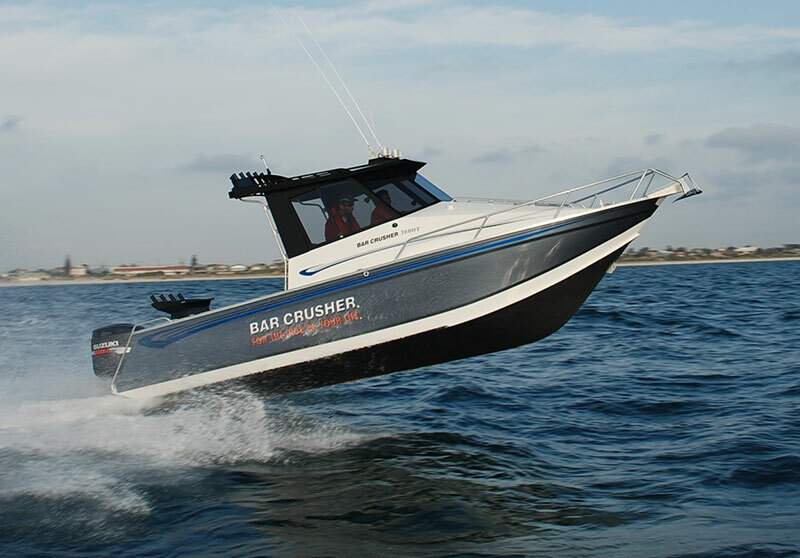 Bar Crusher’s new 760HT (Hard Top) is designed and built for one purpose – long-range offshore sportfishing! At a massive 8.00m LOA, beam 2.47m, with an engine rating up to 300hp and a standard 300L or optional 500L fuel capacity, the 760HT has the ocean-going capability of a flybridge gameboat with the manoeuvrability and versatility offered only by trailerable vessels. Constructed from pre-stressed 5mm (bottom sides) and 4mm (top sides) marine grade plate aluminium, Bar Crusher’s super-tough new flagship model – with its high-tech Waveslicer non-pounding, deep-V hull, and maximum-strength Rigideck sub-floor system – will get you to the fishing grounds in comfort and practical style. Superior stability at rest is assured thanks to Bar Crusher’s Quickflow water ballast technology. The 760HT’s toughened safety glass windscreen and all-weather hard top allows full standing room and an unobstructed 360° view from the helm, while comfortable skipper and passenger seating, full-length 2.1m bunks (with infill cushions for full V-berth), 65L Stainless fridge, plumbed sink, food preparation area and optional gas burner stove facility make this the ultimate trailerable sportfisher for extended offshore adventures. The functional cockpit is ready for serious action – self-draining deck with scuppers, step-through transom, marlin board with berley bucket, rod holders, plumbed livebait tank, in-floor fish storage tank and large-volume storage pockets which will easily accommodate tagpoles, gaffs and other essential equipment. Rocket launcher, hydraulic steering, dual battery system and Hella low-voltage coaming lights are also fitted as standard. Bar Crusher’s impressive options list for the 760HT includes deck wash, overhead Hella lighting, Stress Free anchor winch, Sarca anchor, Porta Potti (dealer-fitted under bunk) and more. Packaged on a tandem Easytow breakaway trailer, approximate tow weight is 2500kg. The new 760HT is now available through dealers Australia wide.